publicity for "The White Cliffs Of Dover"
"Yes, John, I see them. My people and your people, only their uniforms are different... how well they march together. 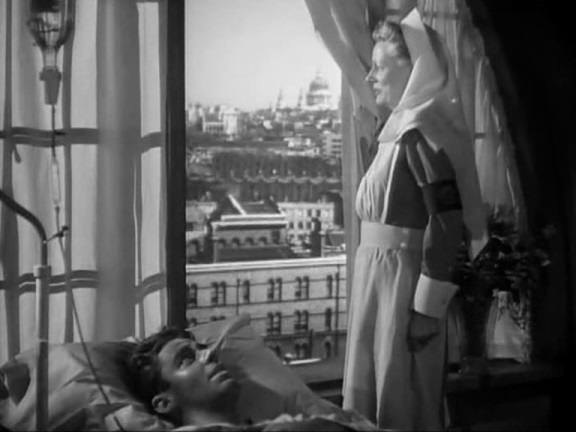 They'll help bring peace again..."
While waiting for a transportation of wounded soldiers at a London military hospital during World War II, American-born Red Cross volunteer Lady Susan Ashwood (Irene) worries about her son John, who is fighting overseas. Her thoughts bring her back to the year 1914 when she came to England on vacation with her father (Frank Morgan), a small town newspaper publisher. In opposite to her father who detests everything English, Susan is instantly taken by the country. On the last night of her visit, Colonel Forsyth (C. Aubrey Smith), an elderly boardinghouse resident, takes her to a ball where due to a mistaking she meets Sir John Ashwood (Alan Marshal). They spent a wonderful romantic evening together but the next day Susan has to return to America with her father. 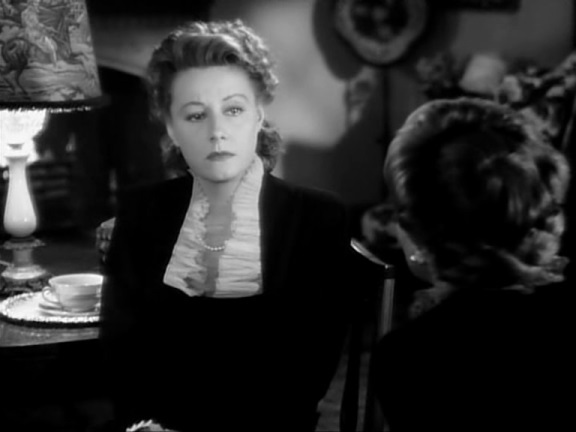 However, their departure is interrupted by John who persuades Mr. Dunn to allow Susan to visit his mother and family at their country manor. first encounter - and that's not Bertie's cousin Nancy! The English country site turns out to be as beautiful as Susan expected it to be but still John's family and their traditions are new and strange to her. Thus, when John proposes she is reluctant to say yes although she loves him. 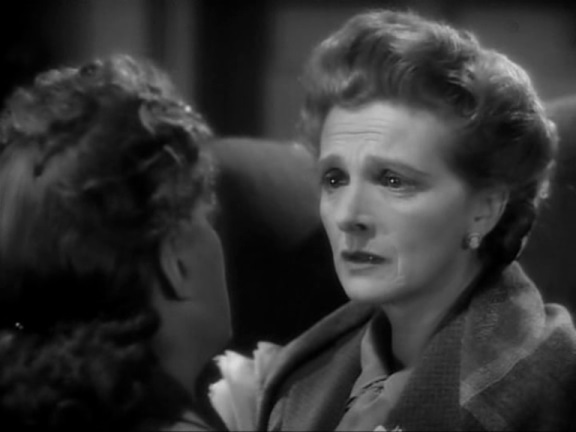 Irritated by remarks of John's mother (Gladys Cooper) and some friends of the family which Susan takes as anti-American and feeling that she doesn't belong and never would fit in, she decides to return to America. 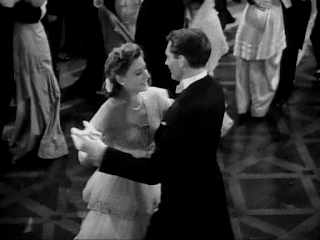 But once again John averts her departure and literally sweeps her off her feet. 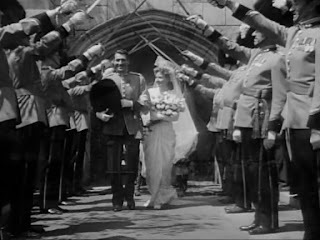 The newlyweds blissful honeymoon is interrupted by the outbreak of World War I and John, according to the family tradition an Army officer, is sent off to fight. After three years of separation, they are reunited in France for a couple of days and relish every moment of their stay. A year later, Susan, on visit in London, watches with her little son John Ashwood II as American troops march through the streets. Thrilled that the Americans have joined World War I, Susan is hopeful that John will soon return to her and see his son for the very first time. But this is not to be and John is killed in action just before peace is declared. 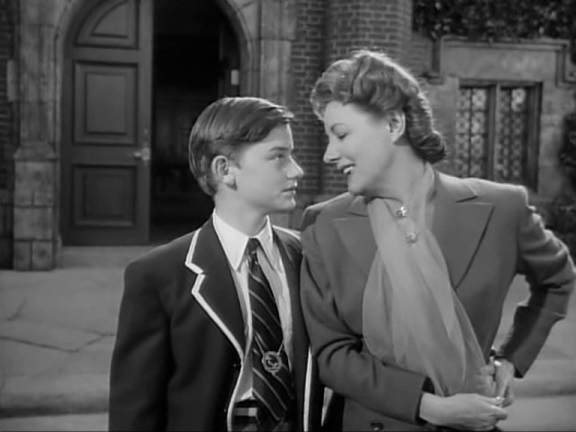 As the years pass by, John Junior (Roddy McDowall) grows up to a decent sympathetic boy, and Susan's father fearing another war urges her to bring him to the United States. But John doesn't want to leave his tenants and his country. "I don't think it smacks of propaganda, but if it does, I'm glad. I feel everything possible should be done to cement the friendship between two nations that are most alike and speak the same language." (Hollywood Studio Magazine) was Irene's comment on "The White Cliffs Of Dover." The Merriam Webster gives the following definition for propaganda: "...doctrines, ideas, arguments, facts or allegations spread by deliberate effort trough any medium of communication in order to further one's cause..."
That's exactly what this film does. The relationship between the two allies, England and the United States, is the golden threat of the picture and "... how well they march together... they'll help to bring peace... a peace that will stick" is its bottom line. The things in common and the enemy in common will overcome all cultural differences. The film effectively pleads its wartime cause. "... I see them...how well they march together..."
Many people call "The White Cliffs Of Dover" a tear jerker but it doesn't really work as such for me. It's almost too slick; everything is almost too beautiful, too perfect. In the 70s, James Bawden asked Irene about "The White Cliffs..." and one thing she said - "Everything was lavish, too lavish if you ask me" - exactly expresses my feelings. However, let's contemplate on the lavish aspects of this production; starting with Miss Dunne of course. 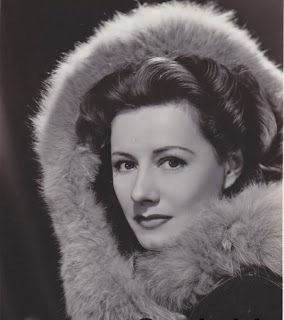 Though surrounded by an outstanding supporting cast - including such illustrious names as Van Johnson, Gladys Cooper, Roddy McDowall, Dame May Whitty and a very young Elizabeth Taylor - "The White Cliffs Of Dover" is truly an Irene Dunne film concentrating on one woman and her fate in challenging times. The picture gives Irene once again the chance to show the development of her character through decades and how she pulled off the young Susan Dunn is simply astonishing. She and Alan Marshal - btw ten years her junior - are the most handsome couple and their love story is simply beautiful. Besides Mr. Marshal, the whole cast holds his own against our leading lady and the direction of Clarence Brown and the camera work of George Folsley do the rest. 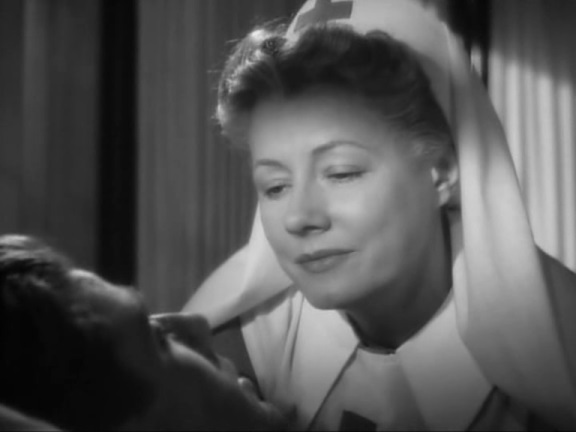 In a word, "The White Cliffs Of Dover" is under all aspects a high-level production and Irene justifiably considered it one of her best films. She is spendidly photographed and one wonderful close-up follows the other. Quite a handsome couple, aren't they? 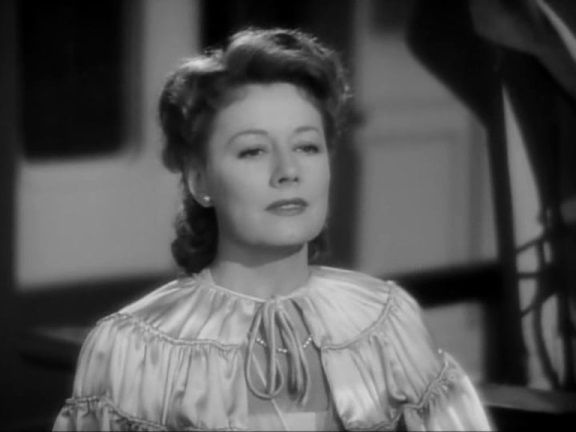 Nonetheless, this film definiteley didn't make my list of Irene Dunne favorites; I appreciate how utterly well done it is, admire Irene's and the whole cast's performance, loved to see Irene and Gladys Cooper together but as a whole "The White Cliffs of Dover" is never tempting for a re-watch. One of my rules for this blog is that I always watch the film again before I write about it - no matter how many times I've already seen it. The session for "The White Cliffs..." took two evenings; in its wartime related effectiveness this picture is rather dated, and, well, rather long. It's no weepie for me, and the whole movie doesn't really touch me beyond the intellectual reflection that I am fortunate to live in a time of peace in Europe. 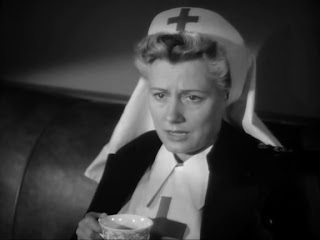 Obviously, I am not too fond of Irene's "war films" but as for La Dunne they are simply a must! Here is the poem by Alice Duer Miller on which "The White Cliffs..." is based. Love your review. Pitch perfect and straight to the point. 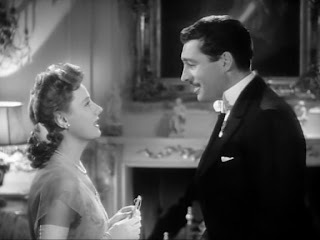 MGM seemed to try to out-Mrs.-Miniver themselves with this one. More gloss, more romance, more pathos, they even throw in an additional war. Well, maybe during the time of its initial release it was palatable, but today, that's another story. Miss Dunne is awesome, isn't she? Lovely to look at and the most wonderful actress. She glides through the movie and is one of the saving graces. 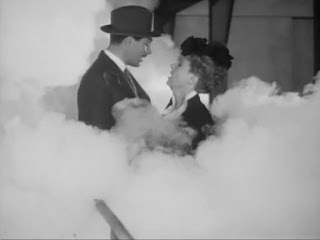 BTW: considering that Miss D. worked simultaneously on "A Guy Named Joe" one has to marvel about her level of energy. Hi Susanne! Your review sums my impression of this film - too "something" of everything if you know what I mean...ID looks perhaps her most beautiful, however, in the lavish costumes, staging, etc. An interesting side note, too, if you've ever caught the You Tube interviews with Roddy McDowall - I think there are a few parts to it - in which he describes a crew member (camera man?) who lit her face with something called an "Obie" - this was a small light that would be shone on Irene's face, thereby illuminating it specially. It was named after Merle Oberon whom, he says, apparently had a skin condition, and this effect and process was named for her. Trivia, I know, but interesting. 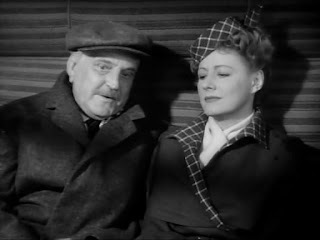 He also makes some other interesting remarks about ID whom he admired from a young age and then actually got to act with her. I think I read somewhere, either here on your website or elsewhere in my ID info-searching, that after meeting her and acting with her, he would ask other actors if they knew ID, and if so, if she was liked by them and, if they did not like her, he would not think well of that person. 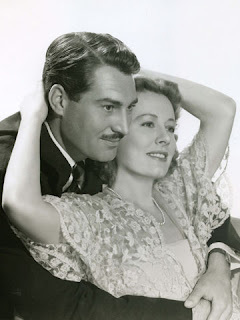 And he continued call ID "mother" whenever he saw her after they made this film together. Best regards - you're a wonder! Hi Mary! It's great to hear from you again and thanks for this interesting tidbit about the "Obie." I don't think this is trivia at all, you know, because how the actors of this era were photographed is one of the very important aspects of those films. Especially the close-ups are often iconic and have a larger than life quality and it took hours to light them properly. The photography is one of the reasons why I am so fascinated by this film era. Sorry, for being such late with my answer! Sorry, got the spelling wrong -- of course it's Dunne!